Hello, this is actually a very random blog post. 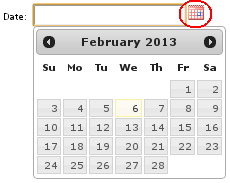 I had to face this problem and there was no solution for it on the internets so I had to face re-coding JQuery's DatePicker code myself. 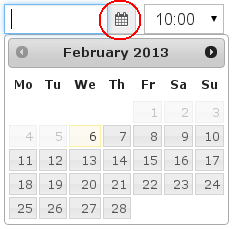 What I wanted to achieve is to add Twitter's Bootstrap icons (or Font Awesome's icons) as a trigger into the DatePicker without providing a link to an image like in this example. As you can notice, I have used Twitter's Bootstrap input-append class to add the icon into the text field. NOTE: You can change the class with another icon of your taste. By the way, I'm using Font Awesome's icons. NOTE: You can, of course, change the div's class into input-prepend. It's a newbie approach and I hope there is an easier/fancier/better solution to this (and if you have a link for such please post in the comments), but as I couldn't find one I had to improvise. Blog contents © n0kS Phr33d0m - Tech blog 2012. All rights reserved. Blogger Theme by Nymphont.